This is the second Senna we have seen for sale and it ain’t going cheap. McLaren has been on a bit of a roll lately, its 720S supercar is as capable as some competitor's hypercars while its latest hypercar, the aptly named Senna, is a track-focused machine with few equals. The bare performance specs are up there with the very fastest road-legal cars ever made. It comes fitted with McLaren’s latest 4.0-liter twin-turbo V8, in this setup it is pushing out 789 horsepower and 590 lb ft of torque through a seven-speed dual-clutch gearbox. It gets to 62mph in 2.7 seconds despite only sending all that motive force solely to the rear wheels, and tops out at 211mph. Production was limited to 500 units, all of which sold out rather quickly despite the $980,000 asking price. Perhaps unsurprisingly, a delivery-mileage example soon popped up for sale on JamesEdition with a $620,000 mark up over McLaren’s own eye-watering charge. Even taking into account the $130K of options this car had, it seemed like a bit of a stretch. Until now that is. 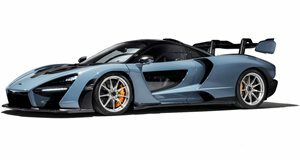 AutoTrader UK is currently listing another Ultimate Series McLaren Senna for sale, this one is going for a cool $2.2 million. Offered by Shaks Specialist Cars, it comes with a range of McLaren Special Operations (MSO) options, including a bespoke interior trim, Amethyst Black exterior paint, and a Bowers & Wilkins Sound System. Its owner managed to rack up a grand total of 665 miles in it and it apparently still has the remainder of the manufacturer’s warranty. MSO options can add a fair whack to the final price of a McLaren but even the laundry list of options on this particular Senna surely would not have more than doubled its price. Yet with mint examples of the P1 hybrid hypercar changing hands for similar money and the iconic F1 hovering around the $15 million mark, this may be one of those moments when we look back and reminisce about how we could have picked up a Senna for a ‘mere’ $2 million. Good thing then that Shaks Specialist Cars has two Sennas for sale. The car named for Ayrton Senna exceeds all expectations.